Lethal yellowing is a disease that is devastating to many types of Palm. It is caused by a phytoplasma, a type of parasitic bacteria that lack a cell wall. I have looked at several other phytoplasma diseases and come up with a solution using IAA to cure the disease (IAA to Activate plant defense mechanism). However, the research that supports that solution was conducted with dicot plants, not a monocot like palm. In addition, the same application of IAA used for dicots would kill a monocot like palm. Monocots are much more susceptible to synthetic auxin than dicots. Is there a solution for palm trees? Let’s examine the pathogenic agent, environment, and host to see if one can be changed to stop this disease. This is an interesting disease. Most diseases are a perfect storm. The pathogenic agent is a phytoplasma from East Africa. The vector, Haplaxius crudus (Formally known as Myndus crudus and Paramyndus cocois) is a leafhopper native to Southern North America, Caribbean, and Central America. The disease spreads well when turfgrass is cut, found in public parks and golf courses. The disease has been observed to affect 30 different species of palm and one other species: Pandanus (Hunt. Introduction. Lethal Yellowing). Coconut palm is of major concern as this disease has the potential to disrupt commercial coconut production and threaten the existence of the species. 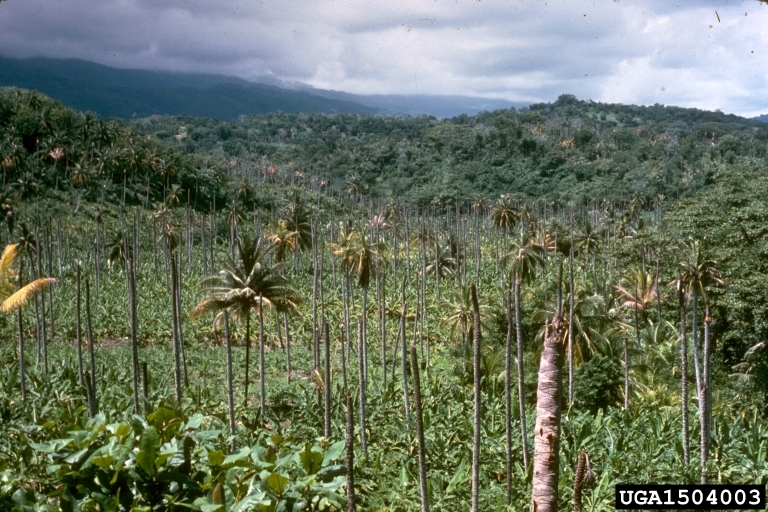 Here is a forest of palm infected with lethal yellowing disease. Phytoplasma (formally called mycoplasma-like organisms or MLOs) are simple bacteria. They lack many of the machinery most bacteria have. They do not have a cell wall and can not live outside of their host or vector. Because of their simplicity, they die easily making them hard to cultivate and study. Lacking a cell wall also makes many antibiotics not effective. It is common to find pieces of bacteriophage in bacteria including phytoplasma. Bacteriophages are viruses that infect bacteria. Often they leave bits of their DNA in the bacteria. If a bacteriophage exists and we can find it then it would be a very effective tool for controlling the pathogen. The virus would act as a predictor for the pathogenic agent, the phytoplasma bacteria. It was noticed that it took almost a decade for the disease to spread from one side of Jamaica to the other side of the island, however it only took three years for the disease to cover most of Florida. This is because people in Florida like to golf. The agent is spread by leafhoppers. This species of leafhopper prefers to lay its eggs in freshly cut grass. Palms that are next to golf courses, parks, or lawns are in the danger zone. These grass areas likely have higher leafhopper and vector populations than cultivated areas in Jamaica. With more vectors then the disease has a much higher chance of being transmitted from one plant to another. We can prevent planting palms next to golf courses and parks. What are other management strategies to reduce the spread of this disease? One way would be to increase a predator of leafhoppers, the vector. I hope you like spiders. One studied (Kiritani, Hokyo, Sasaba, et al. 1970) observed that spiders caused a significant decrease in the population of leafhoppers in rice paddies. There are a number of other papers that support this finding of spiders eating insect pests in agricultural productive areas such as fields and rice paddies. Putting local spiders on palm trees would be an effective way to reduce the population of leafhoppers. This would then reduce leafhoppers from transmitting the pathogen. This assumes that we use spiders that have been shown to eat leafhoppers. A personal note. When I was in Dalat Vietnam, a city in Vietnam known for its agriculture. I visited a smaller village. In the village trees and telephone poles were covered in spider webs and spiders. I believe they allow the spiders to prevent mosquitos and other unwanted insects. The resistance of palm species by hybridizations. One hybrid has already been produced; ‘Malayan Dwarf’ or hybrid ‘Maypan’ (Malayan Dwarf x Panama Tall). However, this hybrid is not completely resistant and can still be infected and die from the disease (Harrison & Elliott. Extension. 2005). The resistance of this hybrid was different in Florida compared to Jamaica. Florida has more lawns and golf courses which are friendly to the leafhopper vector. Development of other hybrids can make palms more resistant. With hybrid palm with proper management (lawns absent) would significantly reduce the risk of lethal yellowing disease. Lethal Yellowing is an important disease as it could wipe out species of palm and threatens the economic viability of coconuts. Can you imagine a world without coconuts? Neither can many of the tropical countries that rely on Coconuts for food, charcoal, wood, and clothing. To solve this disease the pathogenic agent, environment, or host needs to be altered. This can be done by changing landscapes where palms are found by not planting palms next to lawns, encouraging spiders to live on palms, or creating a hybrid palm species that are resistant to the pathogen. Lethal Yellowing: Research and Practical Aspects. Edited: C. Oropeza, F. W. Howard, & G. R. Ashburner. 1995. Kluwer Academic Publishers. P. Hunt. Introduction. Lethal Yellowing: Research and Practical Aspects. 1995. Kluwer Academic Publishers.